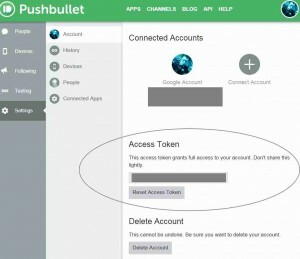 Pushbullet (https://www.pushbullet.com/) is a great tool which can be used on most devices to send notes, pictures, links, etc. For our purposes we can make use of it to send notifications from our NAS to our computer and/or phones. I find this much more convenient than email notifications and have been gradually replacing my email notifications with Pushbullet notifications, since it just pops up on my phone to let me know when the NAS has done something (e.g. finished a torrent download, started up, gone to sleep, woken up, …). Similarly to the email notifications we configured here, the Pushbullet notifications can also be run with one command on the command line. It also simply uses HTTP push commands so you don’t even need to install anything extra to make it work. To get it set up you need to go to the Pushbullet site and register an account. This will let you get your Pushbullet API key. #!/bin/sh # Script for sending notifications to phone and Chrome with pushbullet TITLE=$1 BODY=$2 APIKEY="?????????????????????????????" if [ "$1" = "" -o "$2" = "" ] ; then echo "Use: /bin/pushbullet.sh \"Message Title\" \"Message Body\"" exit 1 fi curl -u $APIKEY: https://api.pushbullet.com/v2/pushes -d type=note -d title="$TITLE" -d body="$BODY"
echo "Use: /bin/pushbullet.sh \"Message Title\" \"Message Body\""
curl -u $APIKEY: https://api.pushbullet.com/v2/pushes -d type=note -d title="$TITLE" -d body="$BODY"
~/scripts/pushbullet/pushbullet.sh "Note title" "Note message sent at `date`"
Also note that you can add Ubuntu variables, such as date above, by putting them in quotes.